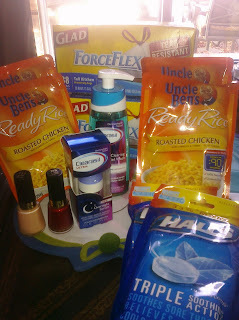 I just got back from Rite Aid and I couldn't wait to share all the goodies with you! I got 2 packages of Halls cough drops (on sale for .99) for FREE with my 2 coupons I won from this instant win game! 2 Revlon nail enamels (on sale for buy one get one for 50% off + then get 2 $3 +UP Rewards) makes it only $ .59 each! 4 Uncle Ben's Ready Rice ($1.99 each, use two of these coupons for $ .75 off 2 + then you will get 2 $1 +UP Rewards back) there is also a $ .30 off one Uncle Ben's rice product for watching the Rite Aid Video Values! That makes them only $ .32 each (if you have the Video Values coupon for November and December)! 2 boxes of Glad Force Flex (38 ct) trash bags (on sale for 2 for $13) use two of these coupons for $2 off ONE!) then you will get back one $1 +UP Reward and also $1 SCR rebate! that makes them only $3.50 a box! I got 2 Clearasil products (both were 50% off on CLEARANCE but then I also got two $2 +UP Rewards back for purchasing 2 products. I also had a $2.00 off one coupon from here and I used the two Clearasil coupons from the Rite Aid weekly ad) I ended getting both of the Clearasil Overnight serum for FREE and the Clearasil Ultra Acne Wash for FREE too! Remember, the Holiday Gift of Savings ends this week on December 25, so keep that in mind! Since I had to spend a bit more to get the $20 gift card, I made sure to meet the $100 (it calculates total before manufacturer coupons!) Now I'll be getting the $20 gift card instead of the $10! Are you planning a trip to Rite Aid this week? What are you gonna get? !